When Canadians watched their hockey team take on the US in the Olympics, a new sport was born: synchronised flushing. 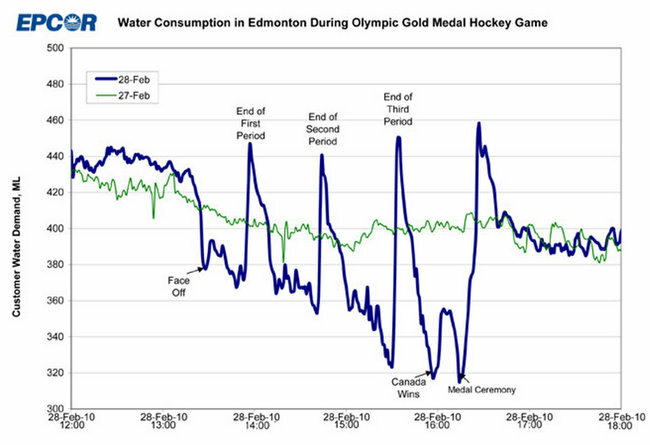 Water use data from the Edmonton water utility, EPCOR, show how residential water use dropped during the game, only to spike between periods. And as the game became more nail-biting, even fewer people would give up viewing for the call of nature. It also appears that them Canadians had foresight – they conscientiously went to the toilet before the game started. If this isn’t a reason to install water meters, I don’t know what is.